By any standards, Sao Paulo is in the league of Tokyo, New York, Beijing, L.A, Berlin and London in terms of world economics and politics. The city is huge; it is densely populated and is graced by more than 16 million visitors every year. For this reason alone, you should have put your radar on this Brazilian city long time ago. Suffice it to say that the city has attracted a lot of investment in the hospitality industry. The restaurants in particular are in a class of their own and looking at the cultural heritage and diversity of the city, they ought to be. The city is home to Europeans such as Portuguese, French, British and Germans. It is also home to the Americans, Latinos, Asians and Africans. This diversity influences what the restaurants cook, bringing out a selection you cannot have anywhere else in the world. Below are the top restaurants in the city. In this restaurant, you can eat indoors, outdoors, or on the patio - your selection. Oh and the food served is delectable. You get to sample the Brazilian seafood that includes the Brazilian fish like the Tucunaré, Tambaqui and Pirarucu not to mention the traditional Brazilian delicacy - the Feijoada. Of the over 1 million pizzas consumed in Sao Paulo, hundreds are eaten at Speranza. For the discerning Paulistanos, this is the pizza place of choice. While at it, why don't you wash down the pizza with in-house specially made margharita? With the brazen architecture that have fashioned this hotel like a large boat, nothing can go wrong at this restaurant/bar. Here you will get the ever popular Cachaca drink - Caiprinha. Make sure you drink it like the locals do. Finally and Arabic restaurant in the heart of Sao Paulo! You get to sample the falafel that will transport you all the way to the deserts of Arabia. Couple this with the Lebanese dish comprising of chick peas, bread and yoghurt and you will suddenly feel like an Arabian Bedouin. 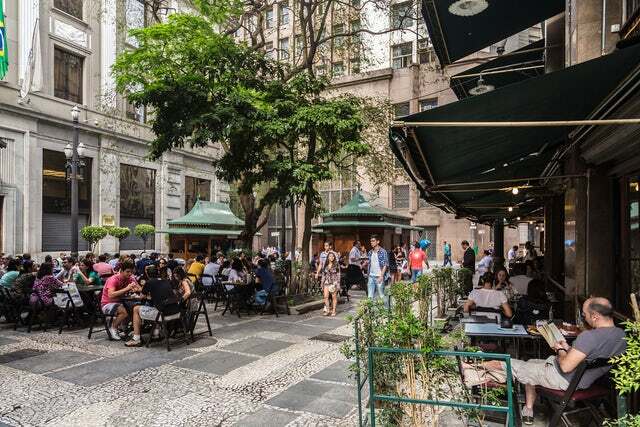 To complete the list of the top five best restaurants in Sao Paulo is this restaurant that is popular for making the best Afro-Brazilian casserole which contains shellfish and cooked in Palm oil. You can also get served with chocolate and priprioca mousse. The fine dining space in Sao Paulo is as amazing as the residents of the city. The melting pot of cultures in this city makes the edict 'world is a global village' ring so true. Trust me; a vacation spent in Sao Paulo is a vacation well spent!